Reliable power transmission to land/ sea level without heavy drag-down from the power cables or tethers. Just as limits on land-based sites and better offshore resources have justified the extension of wind technology offshore, much is made of the increased wind energy density at higher altitudes and reduced energy collection area per MW of capacity, as compensation for the obvious challenges of airborne technology. 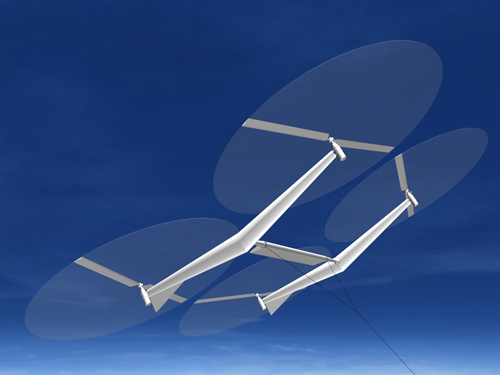 The Kite Gen concept (Figure 3.35) is to access wind altitudes of 800 to 1,000m using power kites in the form of semi-rigid automatically piloted efficient aerofoils. 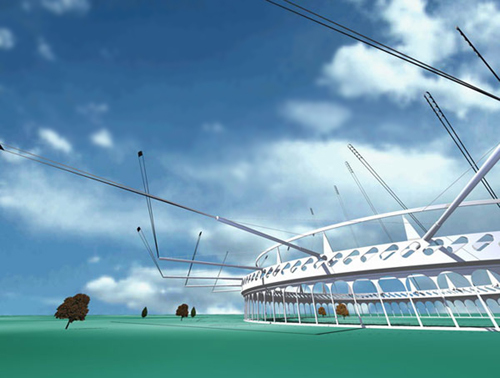 All generating equipment is ground based, and high-strength lines transmit the traction of the kites and control their position. Compared to a rotor, the figure-of-eight path swept by the kite can be beneficial for energy capture, as the inner parts of a conventional wind turbine rotor blade travel at comparatively low speeds through some of the swept area. In the early 1990s, the Oxford based inventor, Colin Jack, patented airborne wind energy ideas, based on the autogyro principle, where some of the lift of the rotor is used to support its weight. This was prompted by the realisation that a balloon capable of supporting the weight of a wind turbine rotor in power producing mode requires much more buoyancy than one able to support the dead weight in calm conditions. This arises from the ‘drag-down’ effect of rotor thrust when the turbine is operating. A recent concept, using auto gyro rotors to be self-supporting as well as generating, is illustrated in Figure 3.36. In November 2007, Google announced a strategic initiative to develop electricity from renewable energy sources and, in particular, are known to be providing R&D funding for Makani Power to develop innovative airborne technology. As yet, no details of the concept are available. 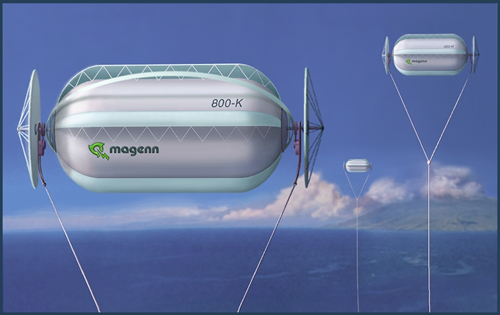 The Magenn Air Rotor System (MARS) is an airborne tethered horizontal axis wind turbine system, with its rotor in the form of a helium balloon. Generation is at an altitude of around 300m, with power transmission down the tether cable. The generators are at each end of the rotor (Figure 3.37), with a direct output power connection to the twin cables. Outboard of the generators at each end of the rotor are wind vane stabilisers in the form of conical wheels. The Magnus effect, associated with the rotor rotation, also provides additional lift, which stabilises the rotor position causing it to pull up overhead, rather than drift downwind on its tether.